The private community of Woodforest outside of Houston offers its residents plenty of outdoor amenities, from hiking trails to tennis courts and the golf course. But the best way to beat the Texas heat for residents of any age is the Forest Island pool complex. The pool was designed to cater to Woodforest’s multi-generational residents, with curved borders that create several defined swimming areas, with everything from sun shelves, a children's log walk play feature, water cannons, deck sprays, and a toddler shallow pool area with zero-entry. To top it off, the pool area features two waterslides that are more than 25 feet tall. When the developers of the Woodforest community approached the design team, they asked for pool amenities that would serve multiple age ranges. In the past, that translated to a lap pool for adults, a toddler wading pool, and a family pool with a slide. What ADE delivered was a design that combined all of these elements together into one pool, while still dividing it into unique zones of activity. Each area is subtly yet distinctly separated, from the tiered waterfall that divides the quieter adult area and its sun shelf with in-water lounge chairs, to the zero-entry children’s wading space that is surrounded by a ledge before dropping into the family play area. While emptying into their own runouts, the two body slides on the 42-foot slide tower overlook the pool deck and even feature spray cannons on the staircase landing. Each part of ADE’s design is made to connect the resident families and create a cohesive poolscape that engages every member of the community. 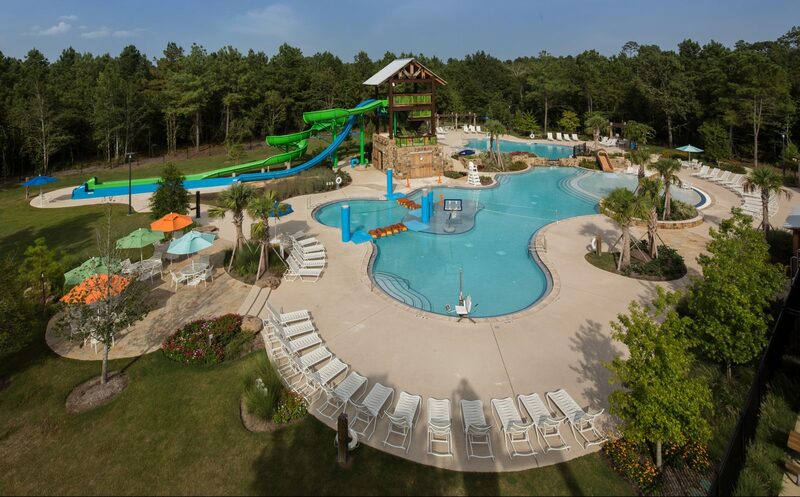 The Houston climate only allows Woodforest residents to enjoy the amenity center for five months out of the year, so it was critical to engineer the pool’s pumps, filters, and UV sterilizers to achieve optimal performance during the summer months. By engineering the pool area to run as one closed system, ADE was able to minimize the upfront costs of selecting only one state-of-the-art regenerative filter, making for a reliable and efficient filtration system that will last long into the future. The biggest challenge during construction was how quickly the slides were assembled; seeing the blue and green slides rising out of the construction site made for very eager residents. On the much-anticipated opening day, hundreds of Woodforest families came out to enjoy the pool, and it has been a treasured community amenity ever since. From pre-design through engineering and post-design, our team at ADE considered every possible aquatic element that could be included into this poolscape to create an all-encompassing amenity that satisfies every member of the family. The result is an award-winning community pool that serves as a differentiating factor not offered at any other master planned community. Woodforest has one of the area’s top selling points for potential home buyers and a neighborhood facility that greatly enhances residents’ quality of life.